The battle over damming Hetch Hetchy Valley in Yosemite National Park was the first national debate over the use of wilderness in U.S. history. It lasted 12 years. The unstoppable fires caused by the Great San Francisco Earthquake of 1906 underlined the city’s need for a reliable water source. So in 1908, the City of San Francisco issued a referendum to the U.S. Congress calling for the damming of Hetch Hetchy Valley in Yosemite National Park to supply the city with water…oh, and electricity. John Muir and the Sierra Club produced and distributed articles, pamphlets and posters to mobilize the public. These acts inspired thousands to send letters to Congress objecting to the dam, and most of the nation’s newspapers to publish editorials condemning the plan. On December 6, 1913, the U.S. Senate voted 43 to 25 on the bill, authorizing the dam. The New York Times wrote, “The American people have been whipped in the Hetch Hetchy fight.” Muir, who once wrote that the battle over Hetch Hetchy was killing him, became sick shortly after the bill’s passage and died of pneumonia in December 1914. Muir advocated that God and nature are one in the same, and there is no difference between the respect we should pay to a natural wonder like Yosemite Valley, or its beautiful sister Hetch Hetchy, or to a man-made marvel like St. Patrick’s Cathedral. If Muir was right, and God = Nature, where does mankind and the organizations it creates, like government, fit in? And is it right to see ourselves as “separate” from nature or above its laws? Can kindness be taught? Do humans develop kindness naturally, or must we teach our children to be kind? If you believe that kindness is something we learn, does it have a place in academic curriculums? We are raising and educating our children in the most competitive academic era that our global society has ever known. Applications to the right preschools now outnumber applications to universities. Middle school sports teams increasingly demand private athletic coaching to ensure a child’s placement on the team. And pressure to score high on college entrance exams has driven some students to unthinkable levels of cheating and mind stimulating drug use. In the face of all these educational challenges, kindness actually helps our children succeed. 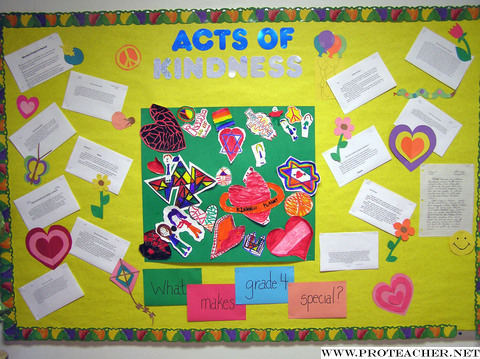 Kindness raises students’ self-esteem and enhances the learning environment. Minds are open and available to greater memory retention in non-hostile settings. So, whether academically proficient or not, students are given a way to excel through kindness. It’s not only struggling students who benefit from a climate of good will. During difficult or stressful times, students are empowered when they take positive action and extend kindness and support to their fellow students. Kindness encourages empathy and helps develop valuable interpersonal skills that will help children succeed in every setting throughout their entire lives. Schools are a great place to build on the beneficial principles of kindness that our children have been nurtured with at home. And if a child has not been gifted a kind loving home, our schools are a great place to start learning about it. Kindness is a great lesson, and not just for tomorrow’s leaders. This week we will be high-lighting standout programs and school across the country educating children on the importance of kindness. Do you know a teacher who deserves a sincere thank you?